Photos by Brandon Macz: Wilridge Winery owner Paul Beveridge has been making wine in Madrona since 1988. 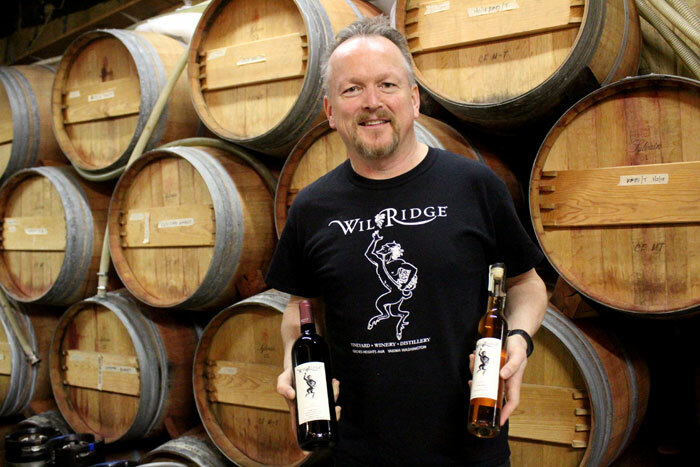 Wilridge Winery makes 25 types of wine, and now brandy. Paul Beveridge tells MPT his interest in wine started while growing up in California’s Napa Valley. His father worked at the mental hospital, he said, and his mother would pick him up after work to go wine tasting. “I got to run around in these cellars and caves, and that was really cool,” he said. Beveridge went on to become an environmental lawyer, moving to Madrona with his then-wife, Lysle Wilhelmi. He was making wine at home, and she wanted to open a restaurant. They found a two-story house in Madrona that had been built back in 1908, where Wilhelmi opened Madrona Bistro, 1416 34th Ave.
“I was making the wine in the basement, and she was doing the restaurant upstairs,” Beveridge said. Wilridge Winery started in earnest in 1990. Beveridge had to lift the building up for his basement winery operation to expand in 1995, which is when the bistro closed and he and Wilhelmi welcomed their first son into the world. “This is a bomb shelter down here,” he said of his reinforced 1,500-square-foot cellar. With barrels of red wine inside, it’s not a bad place to be when the big one hits. In the early days, Beveridge said, he could easily pull in volunteers to crush grapes with their feet in the backyard, producing 1,500 cases a year. Beveridge retired from his law firm in 2006, using the money from his partnership buyout to purchase 88 acres in Naches Heights, near Yakima, where he planted a vineyard. 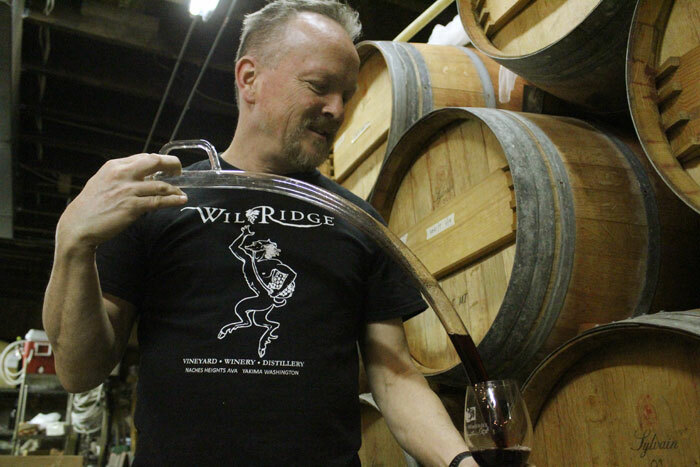 Wilridge Winery now produces 9,500 cases of wine a year. “It’s really a paradise for grapes over there,” he said, producing his first vintages there in 2009. A third of the wine still comes out of Madrona. With his background in environmental law, Beveridge operates a certified organic and biodynamic vineyard, which includes using solar energy, composting waste, snow collection from the winery’s roof, phasing plantings, no outside fertilizers and growing milkweed and sagebrush to help migrating monarch butterflies. “If there’s something we can do to be greener, we’ll do it,” Beveridge said. Above Wilridge Winery’s Madrona cellar is Bottlehouse, a wine bar opened in 2010 by Soni Dave and Henri Schock, the two businesses having a synergistic relationship, Beveridge said. Those interested in a tasting can find vintages upstairs, or try them when the tasting room opens in the cellar on Fridays starting on Valentine’s Day; the tasting room will also open on Saturdays this summer. Beveridge is hosting a white wine and oyster tasting in Madrona from 6-7:30 p.m. on Friday, Feb. 8, where Beveridge is looking for insights into which of his six whites should be entered into a wine-oyster competition. Tickets are $30 and can be purchased here. “I also just happen to like them, and it’s my birthday,” he said. Wilridge Winery also has tastings next to City Fish in Pike Place Market and at The Tasting Room in Post Alley, which is a cooperative of eight wineries. Along with tastings at the Madrona winery spot, people can also get growler refills of Wilridge red wines, sparing some glass from ending up in a recycling center. Beveridge is now also upping production of bagged wine. “We don’t tell them it’s organic until after they’ve tasted it, because most organic wines are terrible,” he said. Beveridge has also been president of the Family Wineries of Washington State organization, which advocates for small wineries and works to remove some of the regulations and bureaucracy that impacts their ability to operate and distribute wines. He and Mt. Baker resident Corbin Hutchins wrote the wine section for Initiative 1183, which privatized liquor sales and closed state liquor stores. “Now, we’re just going, ‘Damn it, we should have asked for more,” he said. Beveridge has a number of grievances about how the Washington State Liquor Control Board regulates alcohol, and particularly how it affects the cost of wine before it gets to customers, but that’s a story for another issue.